This post will set the record straight for a friendly little rivalry that has taken place through the years between the Manchester College students and the Elizabethtown College students who were on the first two UNRRA livestock ships to depart the United States the end of June 1945. When I first talked with Gordon Bucher about his trip on the F. J. Luckenbach to Greece [see Jan. 23 post] that left New Orleans June 24, 1945, he wanted to know, “Wasn’t ours the first ship to leave the U. S.?” Having found the UNRRA records, I was able to tell him, “Yes.” The Elizabethtown cowboys who departed from Baltimore on the SS Virginian June 26, 1945, had always said they were on the first ship out. But diary accounts from the two trips and the UNRRA records show otherwise. Laden with 704 head of dairy cattle and horses, the first consignment of such animals to be sent to a European country by the United Nations Relief and Rehabilitation Administration the freighter Virginian will leave Baltimore today for Greece, where the livestock will be used in an agricultural rehabilitation program . . . . This “first shipment” created a great deal of interest among the UNRRA people and various publicity agencies. The Coast Guard, Life, the Baltimore papers and the newsreel agencies all had photographers on the job . . . .
All of this while the Luckenbach was already on its way. But alas, the Luckenbach was not to be the first to arrive in Greece. The Virginian, departing closer to Europe, arrived at its destination of Piraeus, Greece, the port for Athens, on Saturday, July 14, and gained the honor of delivering the first UNRRA heifers to Europe. The Luckenbach arrived in Patras, Greece, two days later on Monday, July 16. After unloading in Greece, both ships also stopped in Naples to pick up U. S. soldiers who had fought in Europe during the war to take them home – 140 for the Virginian and 150 for the Luckenbach. The Luckenbach, however, arrived home first. 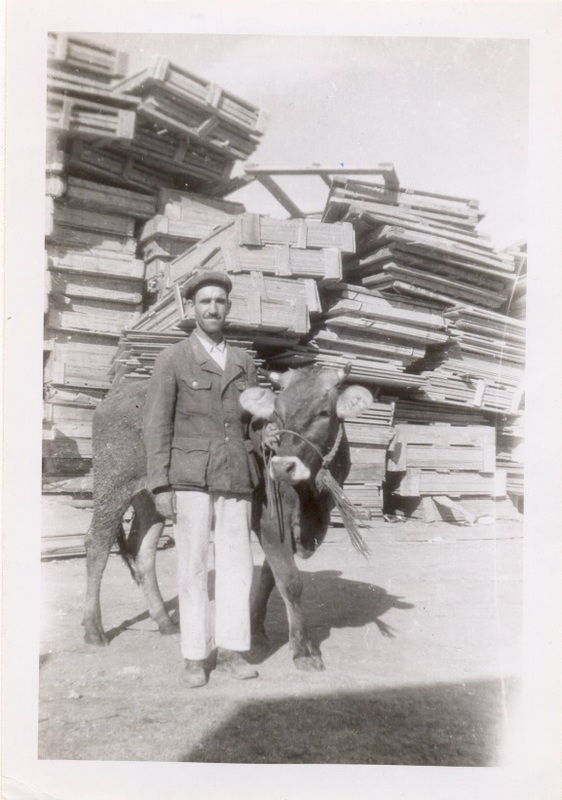 Their entire cargo had been unloaded in Patras, after which they were ready to head back across the Atlantic; whereas the Virginian unloaded only part of its cargo in Piraeus and then had to travel further up around Greece to Salonika to unload the rest. Even with a stop at Béni Saf in Africa to pick up iron ore after picking up their soldiers in Naples, the Luckenbach had a considerable head start on the Virginian, arriving in New York City ten days ahead of them on August 10. They were met with a rousing welcome home for the soldiers on Staten Island complete with a WAC band playing the “Beer Barrel Polka” and a black band playing hot jazz, before finally docking in Jersey City. The Virginian delivered their soldiers to Newport News and finally docked in Brooklyn on August 20. No matter which ship they were on, the cowboys were glad to be back on U. S. soil. Next post: Acropolis or bust! The hair-rising bus ride of the F. J. Luckenbach crew.